Watermark: China Daily, still. Again. hi,Dear Mr.poet: Nice meeting you in the beautiful blog! yes, we are introducing your awesome blog to Chinese readers,to show what life looks like in "a poet's notebook".Our team is called Global Blog,which connects Chinese netizens to wonderful blogs all around the world through brief introductions and blog links. 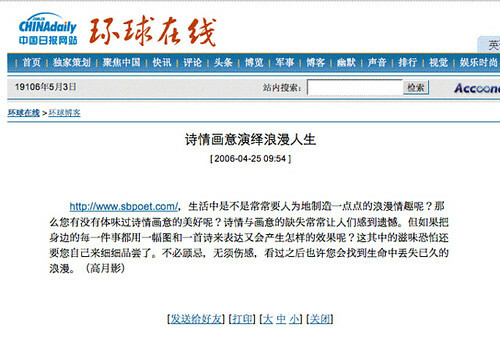 This is a fresh way to show foreign blogs to China and we are the first media to do so. Global Blog belongs to China Daily Website,one of China's top eight news portals at state level.We really appreciate your blog and welcome to our website! Which, I think, pretty much sums it up. Really, I am still delighted by this whole thing. I do think the writer intends to say nice things about Watermark, I just wish I knew what they were. I continue to get a fair number of hits from there. I rather suspect that romantic means something a bit different to the Chinese than it does to us. But, may I be happy! Yes! She too valued those moving, fleetingly wonderful moments that sparkle though your pages -- which in turn flicker on our screens. Perhaps this is what your readers in China are finding so summoning? foolish boy -- googling a name and getting the wrong spelling!